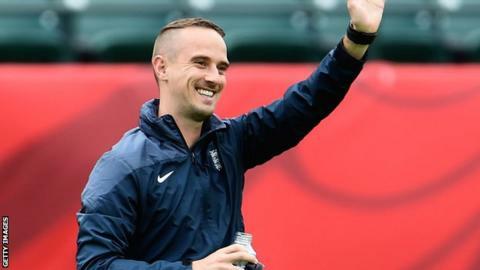 England boss Mark Sampson will use his team's World Cup success as a source of motivation as they return to action with a Euro 2017 qualifier in Estonia. England were third in Canada and the top European team after their third-fourth place play-off win over Germany. Estonia are ranked 77th in world, 72 places behind England. "We saw an England team that believed they could genuinely compete against Germany, we have to keep growing that mentality," Sampson said. "It's great doing it once but we have to do that on a consistent basis. I'm not sure we are quite there yet but the players definitely have the hunger to get there." England's 1-0 win over world number two side Germany was their first in 31 years, but on Monday they will come up against the lowest ranked team in Euro 2017 qualification Group 7, with Serbia, Belgium, and Bosnia-Herzegovina making up the group. Sampson has made seven changes from the World Cup squad, with Manchester City midfielder Isobel Christiansen, Chelsea pair Gilly Flaherty and Gemma Davison, plus Arsenal striker Danielle Carter among those included. Several World Cup players including Lucy Bronze are injured, but Sampson said the introduction of a new group had been inspirational and would allow him to experiment in the build-up to the Euros in France in two years' time. The Welshman said: "It was great to see the new players come in and stand up and talk about what it means to play for England. "All of them have talked about what has gone on in the summer and how that has inspired them. Danielle, Gilly and Issie stood up and said they watched the tournament and wanted to be part of this team, so if that is happening for some senior players, I'm hopeful it will happen for the younger generation." Sampson added: "It's a good chance to experiment a tiny bit, bring some new players in and look at some different shapes."